Will NI's peace walls come down by 2023 to meet 10-year target? This month marks the half-way point in a 10-year plan to bring down all of Northern Ireland's peace walls, but only a few have been removed so far. The barriers were erected to separate mainly unionist and mainly nationalist areas, to prevent attacks on residents living along the interfaces. Many residents view the peace walls as a necessary form of protection. 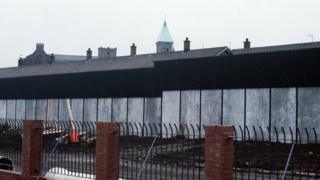 However, some members of a cross-community youth programme in Belfast have called for the walls to come down. Could a new generation, who grew up after the 1998 Good Friday Agreement, help bring an end to the physical legacy of sectarian division? 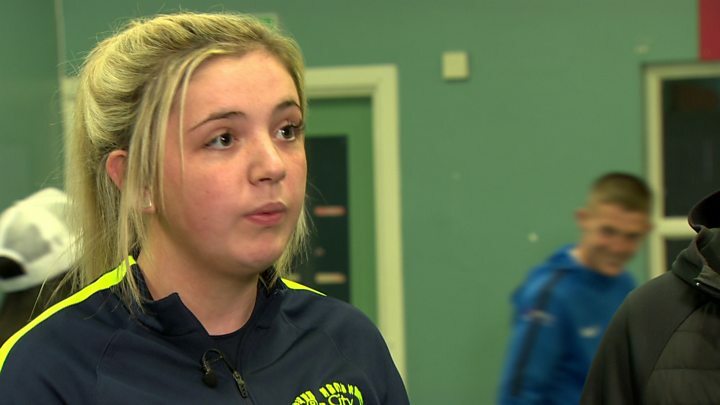 "We don't see the need for peace walls," 18-year-old Aoife Loughran told BBC News NI. She said the sectarian violence of the Troubles had stopped and people in her area of Belfast had "begun to have an understanding" of those from different communities and religious backgrounds. "I wouldn't have a second thought about what someone's religion is, I wouldn't ask them, it's nothing to do with me," she said. The north Belfast teenager added that "in generations to come", the people who want to keep the peace walls would no longer be around, but her generation would still be affected by their decisions. "It's going to be us who have to suffer the consequences, even though we weren't alive in the time of the Troubles." Stewart Pollock, from Belfast's Shankill Road, said he understood that the barriers help to make some people "feel safer". However, he said in his experience, the walls are no longer necessary. "In this day and age, there is definitely no need for them to be there," Stewart said. "I think it's holding us back even more, because [tourists] are coming over and seeing the big walls and they are saying that this country is still behind. "It seems to be the older generation that's still there and they still have a bit of hatred towards the different communities. "But people my age, because of all the different programmes going on, there's not really a big divide. I have a lot of friends from the other community." What is a peace wall? Northern Ireland's so-called peace walls can take many forms - some are high concrete structures; some are metal barriers, others are wooden fences or gates. There are currently more than 60 such interface barriers across Northern Ireland, which are managed by the Department of Justice and the Housing Executive. Many of the peace walls are a legacy of the Troubles, but several more have been erected during the last 20 years of relative peace. In fact, there are now more peace walls across Northern Ireland than there were before the signing of the 1998 Good Friday Agreement. Some of them are considered to be tourist attractions, with taxi drivers offering guided tours of Northern Ireland's shrines to segregation. Five years ago this month - Stormont's then first and deputy first ministers, Peter Robinson and Martin McGuinness, set a 10-year target to bring down all of Northern Ireland's peace walls. The 2023 target was part of the Northern Ireland Executive's "shared future" proposals, aimed at tackling political division and sectarianism. It was an ambitious objective. In May this year - half way along the target timeframe - a small number of the barriers have been removed. There was a significant development in February 2016, with the demolition of an 8ft (2.4m) peace wall that had divided communities in Ardoyne, north Belfast for about 30 years. Despite that breakthrough, in an area which had seen years of sectarian tension, dozens of barriers still run through other interfaces. The majority of peace walls are in Belfast but there also some in Londonderry and others in the Lurgan and Portadown areas of County Armagh. The Housing Executive manages 20 interface locations where barriers have been erected. The Department of Justice originally took ownership of 59 interface structures, but has worked with communities to reduce the number of barriers to 46.